Happy Berry Week everyone! If you’ve been following along, you know that there are some incredible berry recipes flying through the inter webs this week…Links to all of the berry blogging beauties are at the bottom of this post. 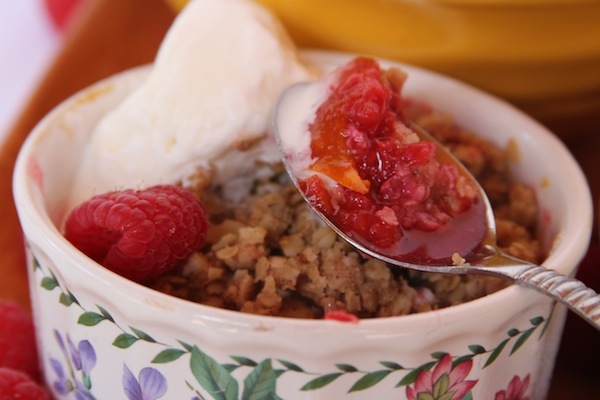 I’m excited to share a recipe with you that combines all of the comfort food of an old-fashioned berry crisp, with a little lightened-up tropical goodness. Oh, and it’s gluten-free too! Now how can you argue with that!? That’s right: You cannot. Served with a scoop of vanilla ice cream…You will be magically transported to your childhood. And Hawaii. And heaven. All at once. Try it, you’ll see. Warm or cold, this stuff is delicious! For this crisp, I combined my raspberries (bought at Costco) with some papaya from our own trees. 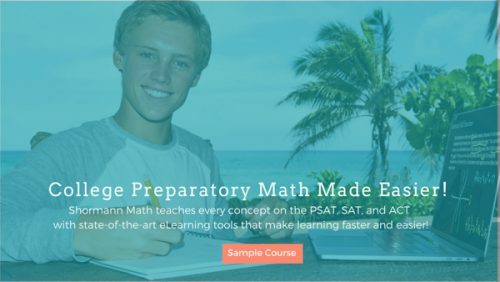 (yay!) As with any crisp, you could substitute just about any fruit for both the raspberries and the papaya. (Mango would be another great tropical touch.) 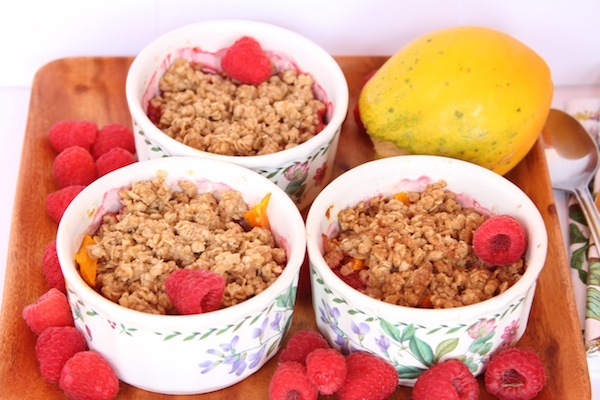 The basic fruit filling here is a very standard recipe, but this recipe provides you with a tropical gluten-free crumble topping. I tried to lighten it up a bit–using some coconut oil in place of part of the butter, and cutting down on the sugar. The gluten-free topping turned out so great–I see no reason NOT to make this one gluten-free, but you can always use all-purpose flour if you prefer. 1/3 cup unsalted butter, cubed up cool, or at room temp. Filling: Add berries, cornstarch, sugar, salt, and lemon zest and stir to combine. Carefully stir in the cubed papaya, and combine well. Pour into a butter-smeared glass or stone bakeware piece, or into individual ramekins. 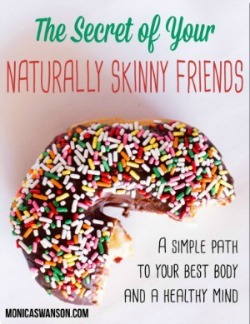 For Topping: Combine oats, brown sugar, flour, optional nuts, and spices in a large bowl. Add coconut oil and combine well. Add cold butter cubes and stir until butter is incorporated. Use your hands to clump the mixture together and crumble evenly over the surface of the fruit. Preheat oven to 350. Cook crisp for 30-40 minutes, until top is golden and crunchy and fruit is bubbling. Allow to stand for 5 minutes then eat hot, warm, or at room temperature. Serve with good quality vanilla ice cream. The recipe I used came from Fellow-Berry-Weeker, Jeanne, of Inside NanaBread’s Head. Legend has it that this is THE recipe for Ben & Jerry’s Sweet Cream Ice Cream Base! Find the recipe, and plenty of other legends at Jeanne’s site–HERE! 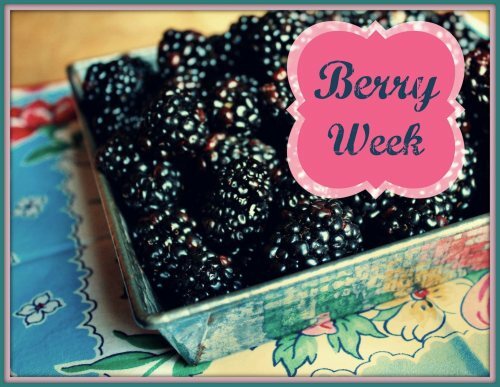 Now for the rest of the Berry Week links: ENJOY! 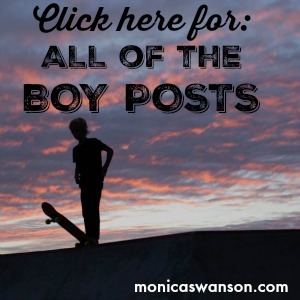 to receive all posts by email–either weekly, or daily, fill in below! Yum! 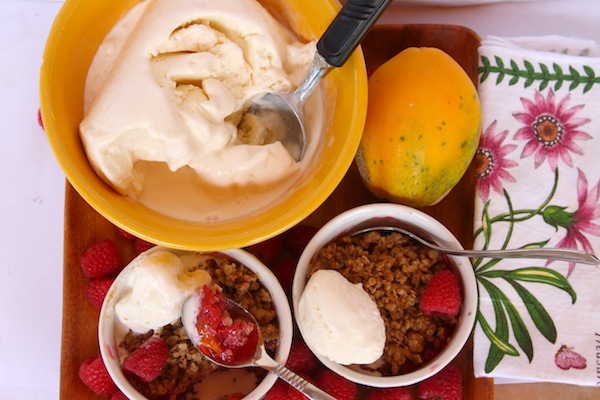 I just love all your summer inspired recipes! I just adore your tropical twists on Theme Weeks. 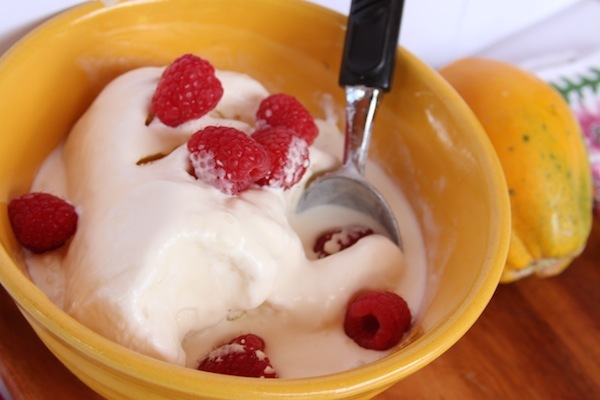 I think I’m going to give your recipe a spin with mango, and the raspberries that we pick this weekend. Although, I must confess that I like my crisps cold and for breakfast. Makes me feel like I’m getting away with something. P.S. Your photography is gorgeous! I made this recipe with blueberries last night. OH MY GOODNESS! YUMMY!! Everyone liked it (except for Andy who doesn’t like anything!!). We didn’t have any ice cream on hand but I did have some whipped cream. It was delicious. My mother-in-law brought me about 5 pounds of blueberries. I think I will be making this tonight with blueberries for dessert. I just happen to have all those ingredients…except the macadamia nuts…..
Oh, Monica! 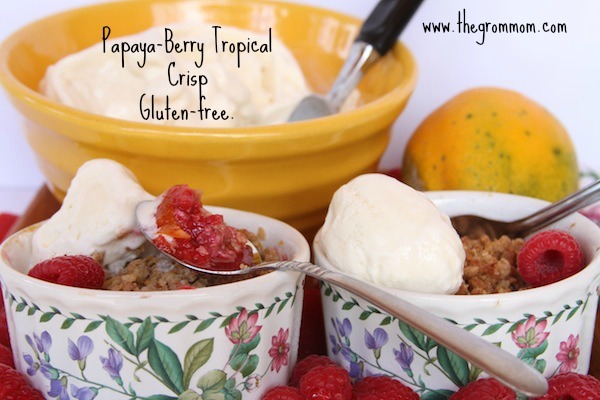 I love a good fruit crisp/crumble/cobbler/pie, and your tropical twist is spectacular! I almost fainted when I saw the macadamia nuts in the crumb topping. Have mercy, I want a big bowl of this for breakfast! Fabulous job, as always. I always enjoy your tropical take on our theme weeks. Hugs to you & the boys!